Objective There is substantial inter-individual diversity in the susceptibility of alcoholics to liver injury. Alterations of intestinal microbiota (IM) have been reported in alcoholic liver disease (ALD), but the extent to which they are merely a consequence or a cause is unknown. We aimed to demonstrate that a specific dysbiosis contributes to the development of alcoholic hepatitis (AH). Design We humanised germ-free and conventional mice using human IM transplant from alcoholic patients with or without AH. The consequences on alcohol-fed recipient mice were studied. Results A specific dysbiosis was associated with ALD severity in patients. Mice harbouring the IM from a patient with severe AH (sAH) developed more severe liver inflammation with an increased number of liver T lymphocyte subsets and Natural Killer T (NKT) lymphocytes, higher liver necrosis, greater intestinal permeability and higher translocation of bacteria than mice harbouring the IM from an alcoholic patient without AH (noAH). Similarly, CD45+ lymphocyte subsets were increased in visceral adipose tissue, and CD4+T and NKT lymphocytes in mesenteric lymph nodes. The IM associated with sAH and noAH could be distinguished by differences in bacterial abundance and composition. Key deleterious species were associated with sAH while the Faecalibacterium genus was associated with noAH. Ursodeoxycholic acid was more abundant in faeces from noAH mice. Additionally, in conventional mice humanised with the IM from an sAH patient, a second subsequent transfer of IM from an noAH patient improved alcohol-induced liver lesions. Conclusions Individual susceptibility to ALD is substantially driven by IM. It may, therefore, be possible to prevent and manage ALD by IM manipulation. The susceptibility of alcoholic patients to develop alcoholic liver disease (ALD) is highly variable. An increased intestinal permeability and a consequent high load of pro-inflammatory bacterial products in blood are common features in patients with alcoholic cirrhosis and animal models of ALD. Intestinal dysbiosis has been associated with alcohol dependence and alcoholic cirrhosis. A ‘cirrhosis dysbiosis ratio’ indicating an imbalance of specific bacterial families has been associated with cirrhosis progression. Severe alcoholic hepatitis is associated with a specific dysbiosis in alcoholic patients. The degree of susceptibility to alcohol-induced liver injury is transmissible from patients to mice by faecal microbiota transplantation. Transplantation of gut microbiota from an alcoholic patient without alcoholic hepatitis can reverse alcohol-induced liver lesions. 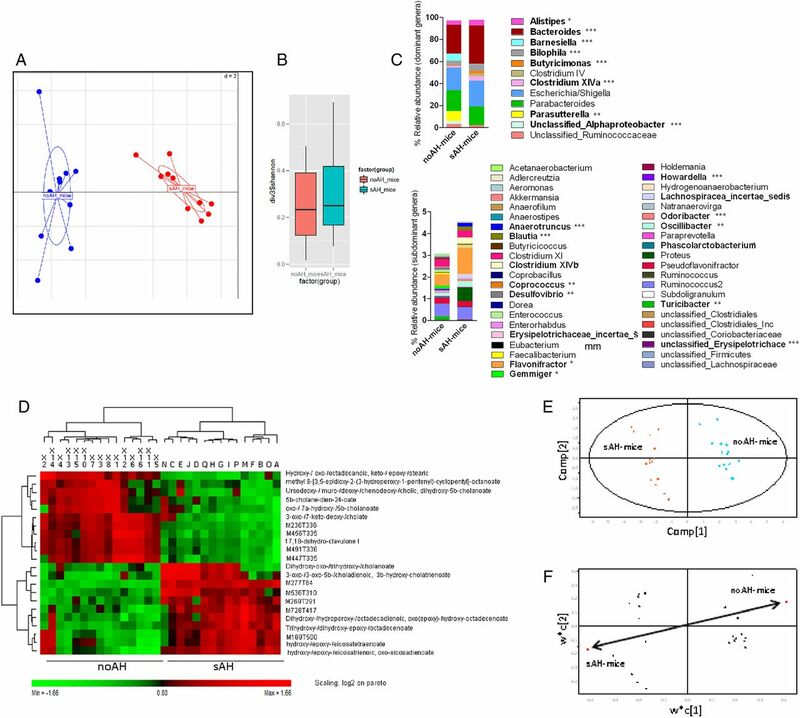 Specific gut microbes and bacterial metabolites are associated with microbiota-triggered alcohol-induced inflammation. The susceptibility of alcoholic patients to develop ALD is highly variable. We demonstrate that the individual susceptibility to alcohol-induced liver injury is driven, at least partly, by differences in intestinal microbiota composition and metabolites. Our findings open new avenues for diagnostic procedures based on personalised medicine by the identification of patients at high risk of developing alcohol-related complications by intestinal microbiota analysis. They also open new possibilities for ALD prevention and treatment through intestinal microbiota manipulation. Alcoholic liver disease (ALD) is a major public health concern. However, factors that link ethanol to the onset and progression of liver injury are poorly understood. The susceptibility of alcoholic patients to the development of ALD is highly variable. Despite a similar alcohol intake, some patients develop severe forms of alcoholic hepatitis (AH) with high mortality rate, whereas others remain reasonably healthy.1 Therefore, other factors besides direct toxicity of alcohol influence the onset and progression of ALD. Nevertheless, the role of intestinal dysbiosis in the individual susceptibility of alcoholic patients to ALD has not been elucidated. Using a strategy based on human gut microbiota transplantation to mice, we aimed to demonstrate that the presence of a specific dysbiosis in patients with alcohol abuse is not only associated with liver injury but contributes to the development of severe liver disease. To investigate whether the severity of ALD was associated with intestinal dysbiosis, we prospectively studied the IM composition of 38 consecutive alcoholic patients hospitalised in our department. Patients were classified into three groups (see online supplementary table S1) according to the severity of alcohol-induced liver lesions (AH score)11: no AH (noAH), non-severe AH (nsAH) and severe AH (sAH). There were striking differences in IM composition between patients with sAH and those with noAH: patients with sAH harboured a dysbiosis characterised by larger amounts of Bifidobacteria and Streptococci and a tendency for less Atopobium than patients with noAH (figure 1A). Enterobacteria counts were high in all patients with AH. There were no significant differences between noAH and nsAH patients for Bifidobacteria, Streptococci, Enterobacteria or Atopobium, revealing that this dysbiosis was specifically associated with sAH. Streptococci counts were positively correlated with the AH score (figure 1B). Enterobacteria counts were positively correlated with blood bilirubin levels and the AH score. Conversely, the numbers of Atopobium and Clostridium leptum, a dominant group of faecal bacteria in adult humans with demonstrated anti-inflammatory effects in the gastrointestinal tract,12 were negatively correlated with blood bilirubin levels and with the fibrosis score, respectively (figure 1B). These results show that, among alcoholic patients, particular groups of gut bacteria are specifically associated with sAH. Particular communities of faecal microbiota are associated with severe forms of alcoholic hepatitis (AH) in humans. (A) Composition of the faecal microbiota of alcoholic patients with different stages of alcoholic liver disease: no alcoholic hepatitis (noAH, N=16); non-severe alcoholic hepatitis (nsAH, N=12); severe AH (sAH, N=10). (B) Correlation between alcoholic patients’ faecal microbiota and the AH score, bilirubin and fibrosis score. Values are means and SEM (A), and correlations (B). Mann–Whitney test (A) and Spearman rank test (B). *p<0.05, **p<0.01. As sAH was associated with a specific dysbiosis, we tested whether the sAH phenotype was transmissible by IM transplantation to germ-free mice. Two patients with excessive alcohol consumption, one with noAH and the other one with sAH (see online supplementary table S2: patients 1 and 3), were selected based on IM composition. We used representative patients rather than combining faeces from several patients to ensure that a balanced and stable ecosystem would be transplanted, favouring colonisation. Two groups of 15 adult female germ-free mice were colonised by oral gavage with the IM from either the noAH patient (noAH-mice) or the IM from the sAH patient (sAH-mice) and were fed a Lieber–DeCarli diet containing 3% ethanol for 5 weeks. Bacterial composition of patients’ faecal samples used for inoculation as well as faecal samples taken from recipient mice at the end of the alcohol-feeding period were deeply analysed using 454 pyrosequencing (see online supplementary materials). A total of 91 234 sequences were obtained, and after stringent trimming, 53 010 sequences (approximately 2600 sequences/sample) were further analysed and assigned to taxonomic levels ranging from phylum to bacterial species and operational taxonomic units (OTUs). This analysis confirmed the high disparity between the microbiota compositions from the two human donors with only 30 OTUs shared by their microbiomes (see online supplementary figure S1). Also, 20 out of 29 genera (69%) were successfully transferred from the patient with sAH to sAH mice, whereas 29 genera out of 40 genera (72.5%) were successfully transferred from the patient with no AH to noAH mice (figure 2A). Distinct selective pressures within the gut habitat of each host but also differences in gut environment between humans and mice, loss of bacteria during the gavage process, as well as effect of Lieber–DeCarli diet, may explain the non-complete recovery of the human microbiota in recipient mice. Phenotype of germ-free recipient mice after intestinal microbiota transplant. (A) Venn diagram based on genera distribution between human donors and recipient mice, (B) food intake, (C) alcohol intake, (D) body weight gain before euthanasia and (E) intestinal permeability. Values are means and SEM. Unpaired t test. N=15/group. *p<0.05. noAH, no alcoholic hepatitis; sAH, severe alcoholic hepatitis. Food intake and ethanol intake were similar for the two groups of recipient mice (figure 2B, C). After 5 weeks on the alcohol diet, noAH mice gained significantly more body weight than sAH mice (figure 2D) and sAH mice had a higher intestinal permeability than noAH mice (figure 2E). Liver weight and the liver/body weight ratio were higher in the sAH mice group (figure 3A). There was a trend towards an increase in serum alanine aminotransferase (ALT) level in sAH mice comparison with noAH mice that did not reach statistical significance (figure 3B). As liver inflammation is usually minor in rodent models of human ALD,13 we quantified intrahepatic inflammatory cells by precise lymphocyte quantification using flow cytometry.14 Liver inflammation was more severe in sAH mice than in noAH mice with more infiltrating CD45+ lymphocytes associated with a higher percentage of CD3+, CD4+, CD8+ and NKT cells (figure 3C). We also semi-quantified by immunohistochemistry, by using a GR1 marker, polymorphonuclear neutrophil infiltration, which is characteristic of human ALD but rarely found in rodent models of ALD.13 We did not find a sufficient number of cells to assess any difference between sAH mice and noAH mice (data not shown). Liver necrosis was severe in sAH mice but not in noAH mice (figure 3D, E). We analysed the expression of 120 genes in the liver of recipient mice. Principal component analysis (PCA) ordination plots of gene expression data show that the two groups clearly separated into two clusters (figure 3F). The largest differences were found in genes related to ethanol metabolism and lipogenesis with decreased expressions in sAH mice (see online supplementary table S3). Analysis of the liver of no alcoholic hepatitis (noAH) and severe alcoholic hepatitis (sAH) recipient mice. (A) Liver weight (left panel), liver weight/body weight ratio (right panel). (B) Serum alanine aminotransferase (ALT) at euthanasia. (C) Liver CD45+ lymphocytes (left panel) and immunocompetent cells (right panel). (D) Representative H&E-stained sections of liver from noAH mice (left) and sAH mice (right) (×250). (E) Necrosis score. (F) Principal component analysis ordination plot of gene expression profiles in the liver of recipient mice: noAH mice (blue spots); sAH mice (red spots). Mean and SEM, unpaired t test (A–C) and Mann–Whitney test (E and F). *p<0.05, **p<0.01, ***p<0.001. N=15/group. Consistent with the increased intestinal permeability in sAH mice (figure 2E), we found that more bacteria translocated through the intestinal epithelium in sAH than noAH mice as measured by fluorescein isothiocyanate (FITC)-labelling and counting (figure 4A). 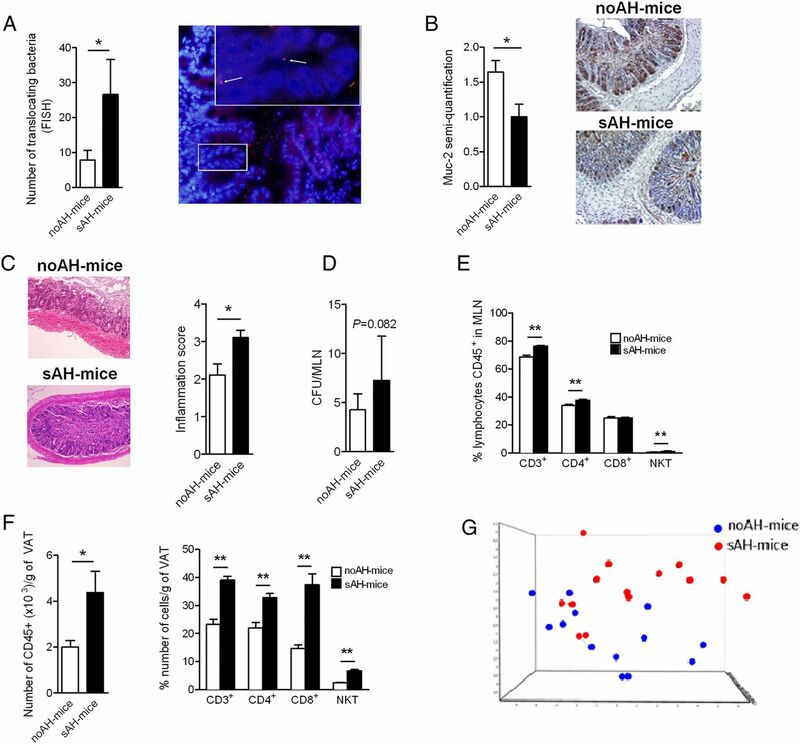 The disruption of the intestinal integrity may have been due to the lower production of mucin2 (Muc2) (figure 4B) and was also associated with inflammation of the intestinal mucosa of sAH mice only (figure 4C). Analysis of intestinal and visceral inflammation in recipient no alcoholic hepatitis (noAH) mice and severe alcoholic hepatitis (sAH) mice. (A) Quantification of bacteria translocating across the ileum and colon (N=8/group). Representative picture of translocating bacteria in colons of sAH mice (magnification×200). Bacteria are in red and nuclei in blue. Arrows indicate translocating bacteria (×600). (B) Immunohistochemical staining of Muc2 in colon sections from noAH mice and sAH mice and semi-quantification. (C) Representative H&E staining of sections of the ileum from noAH mice and sAH mice. Inflammation of lamina propria (arrows) (×250). Semi-quantification of inflammation. (D) Colony forming units (CFUs) of translocating bacteria in mesenteric lymph nodes (MLN). (E) MLN immunocompetent cells. (F) Visceral adipose tissue (VAT) CD45+ lymphocytes (left panel) and immunocompetent cells (right panel). (G) Principal component analysis ordination plot of gene expression profiles in the ileum of recipient mice, noAH mice (blue spots) and sAH mice (red spots). Means and SEM, an unpaired t test (D–F) and Mann–Whitney test (A–C and G). *p<0.05, **p<0.01. The increased intestinal permeability also led to bacterial translocation to mesenteric lymph nodes (MLNs): the number of viable translocating bacteria showed a tendency to be higher in MLN from sAH mice than from noAH mice (figure 4D). Moreover, sAH mice had higher proportions of CD3+, CD4+ and NKT cells in MLN than noAH mice (figure 4E). 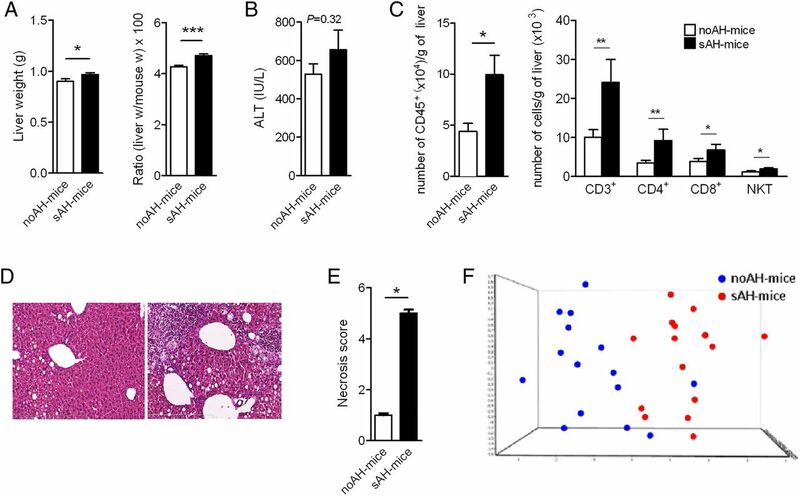 In patients with ALD, inflammation occurs not only in the liver but also in adipose tissue,15 and visceral adipose tissue (VAT), which may affect individual susceptibility to ALD. Accordingly, we found a lymphocyte infiltrate as shown by the CD45+ count with higher proportions of CD3+, CD4+, CD8+ and NKT in VAT from sAH mice than in VAT from noAH mice (figure 4F). This indicates that extension of inflammation to sites distal from the initial site of colonisation is more pronounced in sAH mice than in noAH mice. Consistent with liver gene expression findings, PCA ordination plots of ileal gene expression data show a marked discrimination between the two groups of recipient mice, indicating great differences between the two groups of mice (figure 4G). Online supplementary table S6 shows specific overexpressed genes in sAH mice with respect to noAH mice. Some genes involved in microbial protection such as IDO1 and Reg3γ were overexpressed in sAH mice with respect to noAH mice, whereas CPT1 and MGAT2, involved in lipid metabolism, were more strongly expressed in noAH mice than sAH mice. As in liver samples, ileal expression of alcohol dehydrogenase was weak for the sAH mice group (see online supplementary table S6). 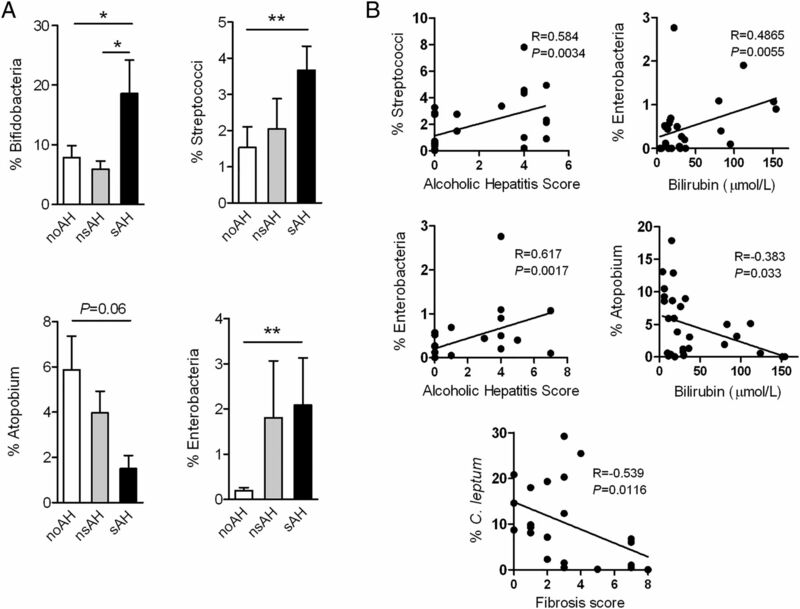 Altogether, these results demonstrate that alcohol-induced liver inflammation triggered by IM in sAH mice is a generalised process, as observed in patients. Gut microbiota composition was compared between sAH mice and noAH mice after 5 weeks of alcohol feeding. PCA based on bacterial genera composition showed that the microbiota from sAH mice and noAH mice differed significantly (Monte Carlo test; p=0.00099) (figure 5A). There was no difference in diversity as indicated by Shannon (figure 5B) or Simpson (see online supplementary figure S1) indices. Gut microbiota composition and metabolites produced. (A) Principal component analysis (PCA) ordination plot of faecal microbiota profiles of no alcoholic hepatitis (noAH) and severe alcoholic hepatitis (sAH) mice at the genus level. The first two components of the PCA explained 36.11% of the total variance (component 1=26.73%; component 2=9.38%”) (Monte Carlo test; p=0.00099). (B) Bacterial diversity as assessed by the Shannon index. (C) Comparison of the intestinal microbiota composition at the genera level between noAH mice and sAH mice. Dominant and subdominant genera correspond to genera representing more and less than 1% of the sequences, respectively. (D) Hierarchical clustering analysis (HCA) of the faecal metabolites. The relative amounts of metabolites in the faeces are displayed as a heatmap (values are pareto and log2 scaled). p Values analysed by partial least square discriminant analysis (PLS-DA) after cross-validation analysis of variance: 1.3×10−15. Percentage of groups assigned according to metabolite distributions: 100% with Fisher’s probability at 6.4×10−9. Putative identification of each metabolite is based on exact mass measurement and comparison with databases. (E) PLS-DA score plot on mouse samples, after first variable selection (first PCA). Red dots, sAH mice; blue dots, noAH mice. (F) PLS-DA loading plot of mice samples, after first variable selection (first PCA). Each black triangle is a discriminant parameter involved in group differentiation and corresponds to one row in HCA. At the genus level, 23 genera differed significantly between sAH mice and noAH mice. Bacteroides was the most abundant genus in both noAH mice and sAH mice but was significantly more represented in sAH mice. Among dominant genera, Bilophila, Alistipes, Butyricimonas and Clostridium cluster XIVa were also significantly more abundant in sAH mice than in noAH mice (figure 5C). Several subdominant genera were more represented in sAH mice too (figure 5C), and Proteus was solely present in sAH mice. Conversely, three dominant genera (Barnesiella, Parasutterella and an unclassified Alphaproteobacteria genus) were more abundant in noAH mice, the latter two being present in noAH mice only (figure 5C). Besides, several subdominant genera including Akkermansia, Howardella, Phascolarctobacterium, Turicibacter, Desulfovibrio or Gemmiger were also specific of noAH mice microbiota. We further identified 56 OTUs that were successfully transferred from sAH donor to sAH mice and were not found in noAH donor and recipient mice (see online supplementary figure S1 and table S4). Several OTUs correspond to bacterial species associated with inflammatory diseases or insulin resistance, including Bilophila wadsworthia,16 Bacteroides caccae17 or Escherichia coli.18 Moreover, 21 belonged to the Lachnospiraceae family, which is increased in alcoholic patients with high gut permeability.9 Conversely, 32 OTUs that were transferred from noAH donor to noAH mice were not found in sAH donor and recipient mice (see online supplementary figure S1 and table S5). Thirteen belonged to the Ruminococcaceae family, which is decreased in alcoholic patients with high gut permeability.9 In particular, two of these OTUs were relatives of Faecalibacterium prausnitzii, a bacterial species known for its anti-inflammatory activities12 (see online supplementary tables S4 and S5). Finally, 62 specific bacterial species were differentially represented (p<0.05) between sAH mice and noAH mice (see online supplementary figure S2). The main bacterial species over-represented in sAH mice were B. caccae, Bacteroides vulgatus, E. coli and B. wadsworthia. Conversely, Parasutterella excrementihominis represented 8.56% and 5.76% of total sequences in noAH mice and noAH donor, respectively, while it represented only 0.001% in sAH donor and was not detected in sAH mice, suggesting that this bacterial species may exert protective effects. To confirm our findings and better mimic clinical conditions, we generated a model based on faecal transplant into conventional mice (figure 6A).We used repetitive doses of polyethylene glycol laxative to prepare the mice intestine for the faecal transplant and actively maintained transplanted IM by repetitive transplantations. To avoid any bias, we did not use any antibiotics. The timetable of alcohol-feeding and IM transfer was selected according to the constraints of the maintenance of the transplanted IM, the short survival of alcohol-fed mice, the time required for the establishment of a new IM and the delay necessary for any improvement of liver disease symptoms to become evident. Thus, a shorter period of alcohol-feeding but a higher dose of alcohol was used in this conventional model compared with the GF humanised model. Alcohol and intestinal microbiota act synergistically to induce alcoholic liver disease. (A) Schematic representation of alcohol feeding and microbiota transplantation procedures. Mice were subjected to an intestinal purge with polyethylene glycol (PEG), gavaged 1 h after the purge with the human microbiota and then twice a week during all the experiment (black arrows). (B) Serum alanine aminotransferase (ALT). (C) Liver triglyceride (TG). Means and SEM. Mann–Whitney test. *p<0.05; **p<0.01; ***p<0.001; ns, not significant. Cv, conventional mice (control mice N=12; alcoholised mice N=9); Cv-sAH-mice, conventional mice transplanted with microbiota from a severe alcoholic hepatitis (sAH) patient (control mice N=14; alcoholised mice N=9); LDC, Lieber–DeCarli diet. In this new model (figure 6A), which is derived from another model of ALD,21 the administration of sAH microbiota by itself, without alcohol feeding, led to a slight but significant increase in ALT (figure 6B). Moreover, alcohol alone without a deleterious IM did not lead to large increases in either ALT activity or liver triglyceride concentrations (figure 6B, C). The combination of alcohol and a deleterious microbiota led to large increases of ALT and liver triglyceride levels (figure 6B, C). Therefore, alcohol and IM appear to act synergistically to cause alcoholic liver lesions. The reproducibility of our findings with the IM from a second patient with sAH reinforces our previous results. We then used our conventional mice model to study whether alcohol-induced liver lesions triggered by IM transplant can regress by a subsequent transplant of IM from a patient without AH. We transferred the IM from a patient with sAH to two groups of mice and triggered liver lesions by feeding them with Lieber–DeCarli alcohol diet. One group of mice was then given the IM from an alcoholic patient with noAH (see online supplementary table S2: patient 2; figure 7A). PCA analyses confirmed that, at the end of the experiment, the IM in the two groups of recipient mice was similar to that in the corresponding donor patients (figure 7B). Reversibility of alcohol-induced liver lesions in severe alcoholic hepatitis (sAH) mice by intestinal microbiota (IM) normalisation. Conventional sAH (Cv-sAH) mice (N=9) were transplanted with IM from an sAH patient twice a week for 4 weeks and Cv-s/noAH mice (N=4) were transplanted with microbiota from an sAH patient for 24 days and then with IM from a noAH patient for 4 days. (A) Schematic representation of alcohol feeding and IM transplantation procedures. Mice were subjected to an intestinal purge with polyethylene glycol (PEG). One hour after the purge mice were gavaged with the human microbiota from an sAH patient and gavaged again twice a week (black arrows) during 21 days. Then, when the full dose of ethanol was reached, mice were gavaged four times during 1 week with the human microbiota of an sAH patient (Cv-saAH-mice) or twice with the IM of an sAH patient and, after an intestinal purge with PEG, twice with the IM of a noAH patient (Cv-s/noAH-mice) (black arrows). (B) Principal component analysis ordination plots of faecal microbiota from the two donor patients (sAH and noAH) and from the two groups of recipient mice (Cv-sAH-mice and Cv-s/noAH-mice) at the end of the experiment (D28). (C) Serum alanine aminotransferase (ALT). (D) Representative pictures of liver sections (×250) and immunostaining with Ki-67 (×400). (E) Ki-67 quantification. (F) Steatosis score. (G) Inflammation score. Means and SEM. Mann–Whitney test. *p<0.05. LDC, Lieber–DeCarli diet. 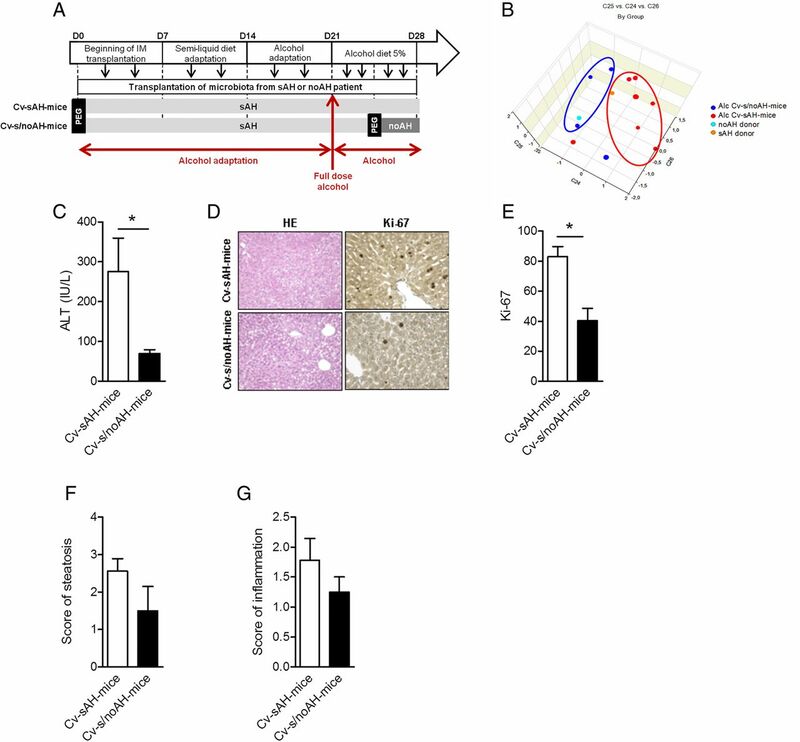 Mice with the IM from the sAH patient showed an improvement of ALT levels and a decrease of liver regeneration following administration of the IM from the noAH patient: (figure 7C–E). There was also a trend for a decrease of the pathological steatosis and inflammation scores (figure 7F, G). These results indicate that IM normalisation, without modifying the alcohol intake, may counteract alcohol-induced liver lesions. We and others have already used this microbiota transplant strategy to demonstrate the causative role of intestinal bacteria in disease development including non-alcoholic fatty liver disease23 or obesity.24 Here, we evidence the causative role of the gut microbiota in ALD development. We further identified bacterial genera and species that were significantly and specifically associated with the noAH or sAH phenotypes. Interestingly, several bacterial groups or species over-represented in sAH mice were already associated with health disorders. This includes Bilophila wadsworthia, which may be able to trigger colitis in genetically prone subjects.16 Similarly, bacterial species belonging to the Clostridium cluster XIVa were found to induce proinflammatory cytokine responses by human mononuclear cells.25 Conversely, known ‘beneficial’ bacteria such as Akkermansia muciniphila that resides in mucus layer, and improves intestinal barrier and metabolic functions,26 and Faecalibacterium prausnitzii, which exerts anti-inflammatory activities and is decreased in patients with IBD,12 were more abundant in noAH mice. 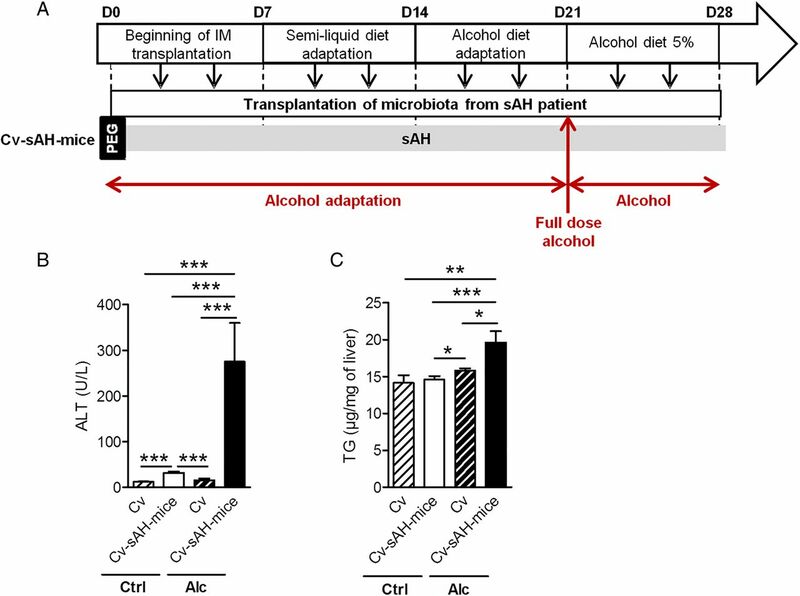 An intestinal dysbiosis has been associated with increased gut permeability9 that facilitates the translocation of IM components contributing to the liver injury, in a fraction of alcoholic patients only.9 Consistently, despite similar alcohol intake, sAH mice had higher intestinal permeability and greater translocation of bacteria to MLN than noAH mice. The intestinal mucus layer, composed of mucins, predominantly Muc2, acts as a physical, chemical and immunological barrier27 and protects the intestinal epithelium against exogenous agents. In our model, the presence of the sAH microbiota was associated with a marked reduction of Muc2 expression and an enhanced expression of the antimicrobial peptide Reg3γ. Reg3γ displays an antimicrobial activity against Gram-positive bacteria. The decreased Muc2 production, together with the enhanced antimicrobial Reg3γ activity, could be important contributors of the dysbiosis associated with the sAH phenotype. The cause of the differences observed in IM between heavy drinkers with different susceptibility to alcohol is not clear. We hypothesise that initial differences in IM may be present before alcohol intake and that alcoholism provokes shifts in IM composition that can condition the host susceptibility to alcohol. Only a longitudinal prospective study analysing the effects of chronic alcohol consumption on IM and the consequences of alcohol-induced dysbiosis on ALD susceptibility could validate our hypothesis. The functionality of a given ecosystem depends on metabolites produced,28 and recent reports have evidenced the great impact of chronic alcohol intake on luminal metabolites.29 We found striking differences in faecal metabolome between the two groups of alcoholised recipient mice. Interestingly, the most discriminant metabolites corresponded to bile acids. This is of special interest as bile acids metabolism is highly influenced by the gut microbiota and may influence glucose homeostasis, lipid metabolism, intestinal motility, bacterial overgrowth, inflammation and cancer.30 We found higher amounts of the primary bile acid CDCA in faecal samples of noAH mice, which has been shown to increase the expression and production of class I alcohol dehydrogenase (ADH1) in vitro.31 Accordingly, we found higher expression of ADH1 in the intestine and liver of noAH mice than in sAH mice. Hence, the IM composition in patients and mice with sAH affects bile acid derivatives, which in turn could affect the efficiency of alcohol metabolism. Similarly, UDCA was more abundant in noAH mice. Ursodeoxycholic acid (UDCA) has antioxidant properties and plays an important role in the prevention of hepatocyte death. Moreover, it is used to improve the prognosis of patients with primary biliary cirrhosis20 or intrahepatic cholestasis of pregnancy.32 This suggests that the IM may confer protective effects by modulating bile acid metabolism2 ,33 and by producing protective metabolites, such as UDCA, which might contribute to the differences in the susceptibility to ALD. Our general findings were thus reproduced with two different pairs of patients in two different mice models of ALD, demonstrating their robustness. Moreover, we show for the first time that the susceptibility to alcohol is reversible, at least partly, with normalisation of the IM. The transmissible factor that drives the susceptibility to alcohol might be within the unbalanced IM ecosystem, the specific transferred bacteria associated with the sAH phenotype, the metabolites produced or most probably, a conjunction of all of them. Further studies investigating the functionality of IM among alcoholic patients with similar alcohol intake and differential ALD phenotype should find the driver of the sAH phenotype. This study, showing the feasibility of transferring a host metabolic phenotype via gut microbiota transplant, highlights the power of the humanised models to investigate the involvement of the gut microbiota in health and disease. Our work opens new avenues for a personalised medicine based on IM monitoring to identify patients at high risk of developing alcohol-related complications. Moreover, our findings open new possibilities for the prevention or treatment of ALD through IM manipulation by the use of prebiotics, probiotics or antibiotics or by faecal transplant. Each patient collected faeces during their first bowel movement following hospitalisation. An anaerobiosis generator (Anaerocult, Merck, Darmstadt, Germany) was added to samples to favour the preservation of anaerobic bacteria. The samples were processed within 24 h and fixed for fluorescence in situ hybridisation, or frozen for bacterial preservation or DNA extraction as described below. Five-week-old female germ-free C57BL/6J mice were used for the IM transplant experiment. These mice were born and raised at ANAXEM, the germ-free facilities of the Micalis Institute (INRA, Jouy-en-Josas, France). The mice were maintained in sterile isolators and kept separate from germ-free breeding pairs. The procedure for IM transplant into germ-free and conventional mice is described in the online supplementary section. Microbiota composition was deeply analysed using 454 pyrosequencing targeting the 16S rRNA gene V3-V4 region (V3fwd: 5′TACGGRAGGCAGCAG3′, V4rev: 5′GGACTACCAGGGTATCTAAT3′). The procedure details are described in the online supplementary section. Statistical analysis was carried out using GraphPad Prism V.5 (GraphPad, San Diego, California, USA). Values are expressed as means and SEM unless indicated otherwise. For comparison of groups, normality tests were used to determine if data followed a normal distribution. Students’ t test was used for data following a normal distribution and the Mann–Whitney test for data that were not normally distributed. Spearman's rank test was used for correlations. For all comparisons, two-sided testing was used unless indicated. A Wilcoxon signed rank test was used to compare the characteristics of the three groups of patients. Values of 5% (*p<0.05), 1% (**p<0.01) or 0.1% (***p<0.001) were considered to be statistically significant. For the metabolome assay, p values were analysed by partial least square discriminant analysis after a cross-validation analysis of variance: 1.3×10−15. Percentage of groups assigned according to metabolite distributions: 100% with Fisher’s probability at 6.4×10−9. The NCSS9 program was used for PCA. The authors thank Martine Bensaada, Benoit Lignon-Couffon, Alain Joffre, Catherine Philippe, Chantal Bridonneau and Jean-Pierre Furet for their collaboration.
. Jejunal microflora in patients with chronic alcohol abuse. Hepatogastroenterology 1984;31:30–4. International Group. Alcoholic liver disease: morphological manifestations. Review by an international group. Lancet 1981;1:707–11. *AMC and GP are co-corresponding authors. Correction notice This article has been corrected since it published online first. The affiliation for C Jousse has been updated. Contributors ML designed and performed the experiments in animals, analysed data and wrote the manuscript. A-MC-D designed, performed and supervised experiments and wrote the manuscript. LW designed and performed experiments and wrote the manuscript. GF, VP, AB and LB performed animal experiments. J-CM and CJ performed the metabolomic analysis. BL and LL conducted gene expression analysis. FC, A-MG-C and TL-R conducted sample analysis. PL analysed MI sequencing data and statistics. SR advised in animal experiments. FG, DB and SP performed histological analysis. HA and DC conducted the statistical analysis. SN designed the project. PG designed the project, supervised experiments and wrote the paper. GP designed the project, included patients, supervised experiments and wrote the paper. All authors discussed the results and commented on the manuscript. Funding This work was supported by the FRM (Foundation for Medical Research), INSERM, Univ Paris-Sud, ERAB (European Research Advisory Board), SNFGE (French National Society of Gastroenterology), AFEF (French Association for the Study of Liver), IREB (Institut de Recherches sur les Boissons), IRIS (Institut de Recherches Internationales Servier). Competing interests ML was supported by EASL (European Association for the Study of Liver) and INRA, and FC by the French Ministry of Research and ARC (Association pour la Recherche sur le Cancer). GP has received travel funds from Janssen, Abbvie and Gilead, consulting fees from Bayer, Biocodex, Roche, Gilead and Servier, and royalties from Elsevier-Masson and John Libbey Eurotext. Ethics approval This study was approved by the local ethics committee (CPP). The animal experimentation had authorisation 78-60 from French Veterinary Services. Data sharing statement All the data of the present study are published in the present manuscript.